The Property Financial Statement for Excel organizes assets and liabilities into a professionally formatted, easy-to-read statement of up to 16 pages in length that will impress any lender and help secure loans and financing. Choose between one or two applicant modes; list up to 30 100% owned properties and up to 14 additional partially-owned properties. When using the single-applicant mode, entering information in all data-entry areas (including those that would have been reserved for the co-applicant), effectively doubles the input capacity of the program. Switch back and forth between modes by clicking a single button. Property Financial Statement for Excel also allows to accurately show cash-in-accounts entries for those who maintain separate bank accounts for various properties. Data can then be saved for fast, easy updates for future reports and ongoing comparison and use the convenient PDF (portable document format) print driver to create your statement as a PDF file to email as a simple attachment. It can also be indicated whether securities and other cash savings are part of your IRA, and IRA monies are shown as a separate line item. 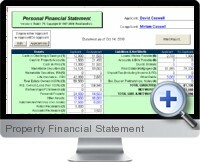 Property Financial Statement for Excel includes instructions and free technical support.